THE GOVERNOR OF Puerto Rico announced today that the US territory would seek a form of bankruptcy protection to restructure its $70 billion debt, the largest municipal restructuring in US history. By declaring bankruptcy, the territory can prevent any interruption in services to island inhabitants, Governor Ricardo Rossello said at a news conference. “I have taken the decision to ask… that Puerto Rico be allowed to place itself under Title III protection to be able to develop a restructuring plan concerning repayment of the debt,” he said. The mountain of debt has left Puerto Rico struggling and the island has several times failed to make payments, including a $2 billion instalment in July. Puerto Rico is barred from using the same bankruptcy law provisions benefiting other US municipalities. Introduced in 2016, the legal provision invoked by the governor would allow Puerto Rico to restructure its debt if San Juan fails to reach an agreement with its creditors. Rossello’s decision came two days after the end of a moratorium on payments to creditors. Several of the island’s creditors yesterday had rejected the island’s offer to repay 50 percent, preferring to take the matter to federal court to seek the full amount. 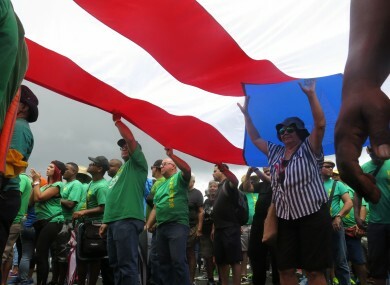 “This bankruptcy process is vital so Puerto Rico can receive the debt relief it was promised,” said Eric LeCompte, executive director of Jubilee USA, which promotes debt forgiveness for poor countries. The “process can bring the debt back to sustainable levels, protect vulnerable communities and promote transparency,” he added in a statement. Email “US territory of Puerto Rico wants to go bankrupt over $70 billion debt”. Feedback on “US territory of Puerto Rico wants to go bankrupt over $70 billion debt”.